PCSK9 is a crucial protein in the regulation of plasma cholesterol homeostasis. It binds low density lipoprotein receptor (LDL R) to enhance the degradation of LDL R. Therefore, inhibition of PCSK9 has been considered a promising strategy to prevent the receptor from being degraded and promote removal of LDL cholesterol from circulation. This pair is useful for screening for inhibitors of human PCSK9 binding to human LDL R.
Upon receipt, please store all items at -70℃. After reconstitution, the stock solution should be kept at -70℃. It is recommended not to freeze thaw more than 3 times. a) Coat the plate with human LDL R.
b) Add your molecule of interest to the plates. c) Add human PCSK9-Biotin to the plates. d) Add Streptavidin-HRP followed by TMB or other colorimetric HRP substrate. Finally, the ability of your compound to inhibit PCSK9: LDL R binding will be determined by comparing OD readings among different experimental groups. 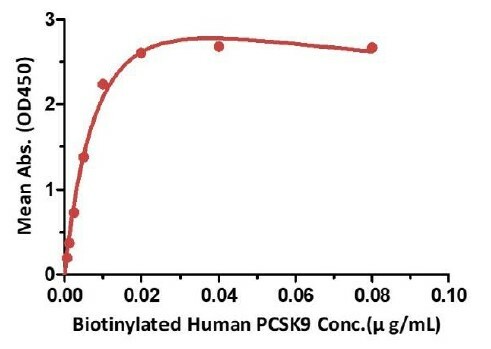 Binding of Biotinylated Human PCSK9 to Immobilized Human LDL R in a Functional ELISA Assay. Immobilized human LDL R protein at 3 μg/mL (100 μL/well) can bind biotinylated human PCSK9 with a linear range of 0.000625-0.02 μg/mL when detected by Streptavidin-HRP. Background was subtracted from data points before curve fitting. Inhibition of PCSK9 [Biotinylated] : LDL R Binding by Anti-PCSK9 Neutralizing Antibody. 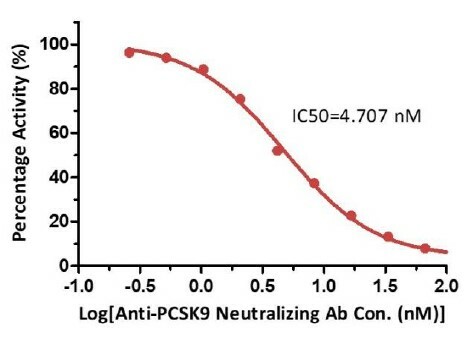 Serial dilutions of anti-PCSK9 neutralizing antibody (Catalog # PC9-NA003) (1:2 serial dilutions, from 20 μg/mL to 0.04 μg/mL) were added into PCSK9: biotinylated LDL R binding reactions. The assay was performed according to the above described protocol. Background was subtracted from data points prior to log transformation and curve fitting.